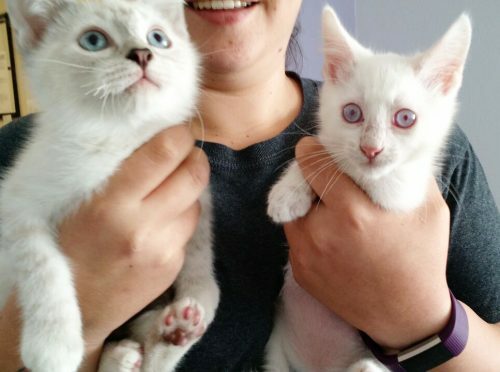 Los Angeles, CA — Kittens abound at Society for the Prevention of Cruelty to Animals Los Angeles (spcaLA), but this summer, a very unusual feline came to the shelter: a rare albino kitten. Moonbeam, a 2-month-old albino kitten, is available for adoption at spcaLA PD Pitchford Companion Animal Village & Education Center in Long Beach. While hundreds of cats and kittens are adopted from spcaLA every year, an albino is highly unusual. Albino kittens are born with a lack of pigmentation and have pale pink skin, white fur, and pinkish red or light blue eyes. Albinos are extremely rare and only make up about 2% of the feline population. “Little Moonbeam reminds people that there are many, many cats and kittens waiting for adoption, and if you can’t adopt, please donate to their care,” said Madeline Bernstein, spcaLA President. In the past, “kitten season” was known as the spring and early summer months, but now kittens are born year-round, with a noticeable spike in the summer. These tiny arrivals need care, including foster volunteers, veterinary services, and supplies, like food, litter and toys. To see a complete list of items visit spcaLA.com or donate at any spcaLA location during business hours.